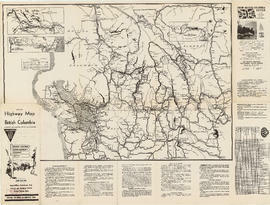 Item is a promotional brochure for the British Columbia Electric Railway Company with a map of Greater Vancouver on one side and information and advertisements on the other. 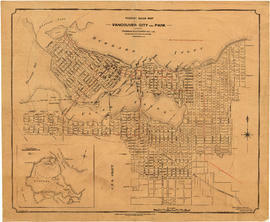 Item is a map of Greater Vancouver with a street index on verso. 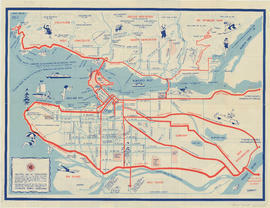 Map shows city streets, schools, firehalls, parks and golf courses, railways, street railways and interurban lines, hospitals and bus routes. Includes guides to accommodations, theatre and performing arts, attractions, shopping centres, etc. Item is a tourism brochure with a map on one side and tourism information on the reverse. 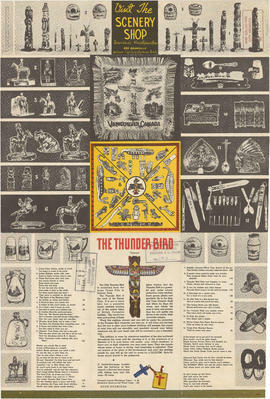 Part is one side of a brochure for the Scenery Shop, displaying images , descriptions and prices of various souvenirs available. 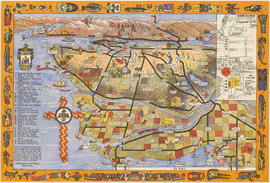 Part is the reverse side of a tourism brochure, containing a tourist map of Greater Vancouver, showing major roads, locations of tourist attractions and recreational sites, and routes into Vancouver. 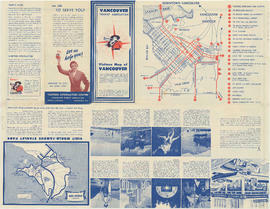 Item is a pamphlet containing a visitors map of Vancouver on one side, and a detailed map of Downtown Vancouver with a list of businesses and services on the other side.